Lauren Daigle - Biography, Is She Gay or Homosexual, Who is Her Husband? Lauren Daigle – Biography, Is She Gay or Homosexual, Who is Her Husband? As big as the Christian music industry is, it has never been one to enjoy mainstream attention from music lovers. The genre has always had its recognition and attention confined to Christian organizations, from awards to news to fans. Once in a while though, an artist comes along and shatters that barrier, breaking through the wall between Christian music and mainstream music and often times, they enjoy remarkable success for it. Today, that artist is Lauren Daigle. She is an artist often described as a contemporary Christian musician. Through the popularity of style, which has enjoyed the praise of mainstream musicians like Selena Gomez, she has been nominated for several awards including the Grammy Awards. Who really is Lauren Daigle, the musician redefining Christian music? Learn more about her by reading below. Lauren Daigle is a Lafayette, Louisiana born artist who has found her calling as a musician. Her professional career is barely a decade old, but she has reached admirable heights. Lauren fell in love with music at an early age. She was raised in a home that embraced music, all kinds of it, from Cajun to blues to zydeco music. She would sing all day, prompting her mother to once describe her house as a ‘music box’. Although she loved music and enjoyed it, Lauren did not consider it as a career option during the early days of her life. Not until she contracted an infectious illness named mononucleosis that she began to consider music as a career option. The illness kept her out of school for two years, forcing a redirection of her formal education. At the end of her two-year quarantine, she attended a charter school where she made up for her two years outside a school wall in six months. She set off to Brazil for mission work before she returned back to America to complete her formal education at Louisiana State University. Being a member of the choir in her local church, her singing talents were not unknown to those around her and she was eventually encouraged to try out for a singing competition. Lauren Daigle contested for American Idol in 2010 and 2012, but it was never meant to be her path to success as she crashed out of the competition before she made it to the final 24 contestant stage. Although she was considered not good enough by the judges of the show, Lauren was considered good enough to feature on North Point InsideOut’s album, Hear. She made her professional debut on the album, featuring in the songs ‘Close and You Alone’. She also lent her voice as background vocals to a local band, The Assemblie whose album topped charts on the US iTunes. It happened that when she was invited as a member of a workshop, the guest singer for the workshop fell ill which she subsequently replaced. This then led her to sign a recording contract with Centricity Music in 2013. Her first solo project under the label was a single, ‘Light of the World’, which was part of the label’s Christmas album in 2013, Christmas: Joy To The World. The reception of the single caused Lauren Daigle to go on tour with Aaron Shust and Mikeschair in the Morning Rises Fall Tour. 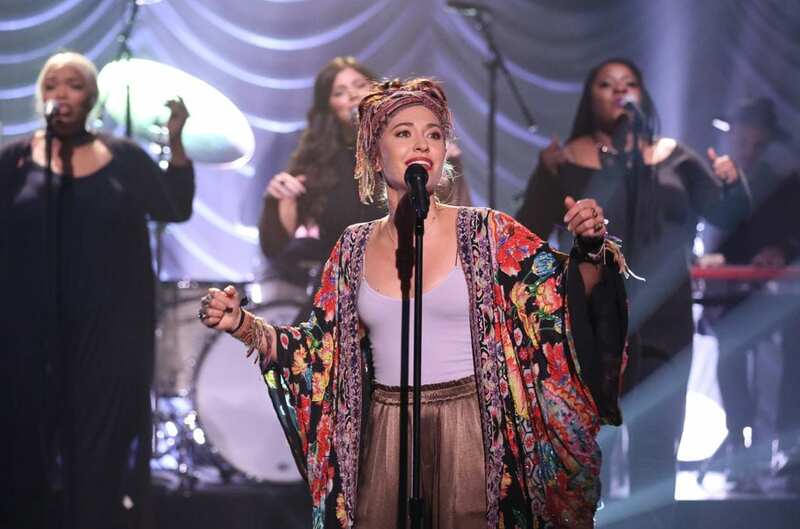 Lauren Daigle on Nov. 7, 2018, performs “Look Up Child” on The Tonight Show Starring Jimmy Fallon. Her first full-length project was the EP, How Can It Be. She released the album on April 14, 2015, and it went straight up to number one on the Billboard Christian Albums Chart. On Billboard 200, the album peaked at number 16, in a rare feat for a Christian album. The album was certified gold after 18 months of release. Since its release, she has two more albums, including the most recent Look Up Child. Lauren’s discography so far has earned critical and commercial acclaim. She has been nominated for 25 awards across four major award organizations – American Music Award, Billboard Music Awards, Grammy Awards, GMA Dove Awards. She has won 11 of them thus far. Who is Her Husband? Is Lauren Daigle Gay or Homosexual? At the moment, Lauren Daigle’s focus is her music. She isn’t known to be in a romantic relationship either. The artist whose career is on a high-speed rise is mostly considered to be single. When it comes to the Christian community, homosexuality is a big topic for debate that divides opinions among members of the community. Lauren Daigle, as a member of the community, has recently suggested she has no judgment for homosexuals, a controversial stance in the community. Combined with her lack of a public heterosexual relationship, this has resulted in rumors of her being gay. Due to the limited information about her personal life, there is nothing to neither confirm nor deny she is gay.